There is always a fun way to pass the day in the Greater Toronto Area, but spending the day shovelling is not one of them. 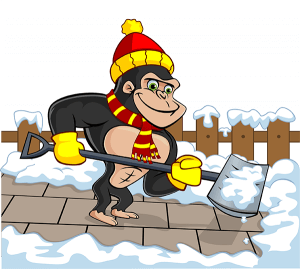 Instead of spending your time freezing your toes and nose off, call a Gorilla to keep your winter wonderland in good shape. A proper snow removal service helps keep your feet on the ground and your mind off of the cold during the winter season. The Etobicoke community sees one of the highest rates of snowfall across the GTA, so it is no wonder that our Gorillas are kept busy. You might spend an entire day removing snow and ice only to have it buried again 48 hours later. For the most part, snow accumulation happens overnight when temperatures are at their lowest. This means waking up in the early morning only to have to wade through fresh snow. Having snow or ice around your commercial property can be more than a minor nuisance. All it takes is one slip or fall to create a big problem for you or to stop your customers from coming back. Instead of taking the risk, have our Gorillas create a safe environment for yourself, your visitors and your clients. Instead of focusing on one area of expertise, our Gorillas round out our snow clearing services to include residential, commercial and multiunit properties. Commercial snow removal requires a bit more than a shovel! For areas that are larger, such as parking lots, snow plowing is a must. With services including by-hand treatments such a shoveling, along with mechanical methods like snow blowers or plows, there is no space that a Gorilla can’t handle! There is no set way to predict the future but there is a way to make an educated guess about what is in store for your community. By following weather patterns, our Gorillas can predict just how much snow and ice is headed your way! Ice control is a main feature of any maintenance service. It might seem simple enough to handle a slippery surface but properly treating ice is trickier than it appears. As temperatures change, large patches of ice can form as snow melts and begins to refreeze. Following weather patterns also allows our specialists to prepare the right removal equipment for the job at hand. Because snow fall is most problematic at night, our Gorillas are used to getting their paws dirty after conventional work hours. You don’t have to worry though, because our Gorillas don’t make a lot of noise! We might move silently, but you won’t ever miss them. With flashy uniforms and vehicles, you can also pick a Gorilla out from a crowd. Give yourself a little peace of mind by calling a professional snow removal company to get your through those chilly winter months!